Vikings Voyage Slot Information, Screenshots and which online casinos offer Vikings Voyage Slot for Play. This Online Slot is an RTG Slot with a Free Spin Feature and Random Jackpot. Become a Viking for a day and win big bucks! Vikings Voyage Slot is a 5 Reel, 20 Payline Progressive Video Slot featuring a Multiplier and Free Spins. Imagine what is like to be a Viking - a proud, brave nation taken out by a new religion – Christianity. Now these Vikings only appear in movies, books, slots and myths. In this game you can get a feeling of what is was like to be a Viking by joining them on a Voyage. This game is also unique because it pays both left to right and right to left. This doubles the many ways to win on each spin. Golden Bearded Viking, Nordic Lady, Axe, Chalice, Longboat, Golden Coins, Wine Goblet, Ace, King, Queen, Jack, Ten and Nine. The bet ranges from .01 to 100.00 when playing .01 to 5.00 per line. It is recommended to play the maximum bet since the Bonus feature uses the total bet for the scatter pay wins. The Wild Viking appears only on Reels 1 and 5 with no multiplier attached to it. But the Viking still substitutes for all other symbols, besides the Scatter symbol. Scatters can appear Left to Right and Right to Left, but don’t act alone. 3 or more Scatters can trigger 10 Free Spins only when appearing Left to Right. Wins get doubled during the Free Spins. Should 2 or more Scatters appear Left to Right 2 to 10 re-spins can be won. 4 or 5 Scatters showing up on a re-spin will trigger 3 or 5 more games respectively. The Jackpot begins at 1 000 and is shown at the top of the reels. There is no need to bet a specific amount or line up a specific combination to win. The Jackpot hits at random while the reels are spinning. 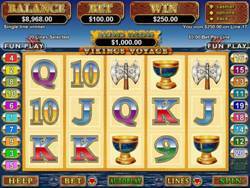 Vikings Voyage Slot slot is very tempting with the colorful graphics, and entertaining characters!